Take a classic hot artichoke dip, add salmon, then deconstruct it onto this pizza. It is cheesy, hot, gooey, and a terrific way to enjoy a seafood pizza for pizza night. I've added a new category to my Visual Pizza Recipe Index--Seafood Pizza Recipes. I've added this as a service to my readers despite the fact I feel that all flesh is meat, including salmon, lobster, muskrat, alligator, capybara, and conch. But hey, you do you. If you prefer doing penance by eating lobster, rock on. 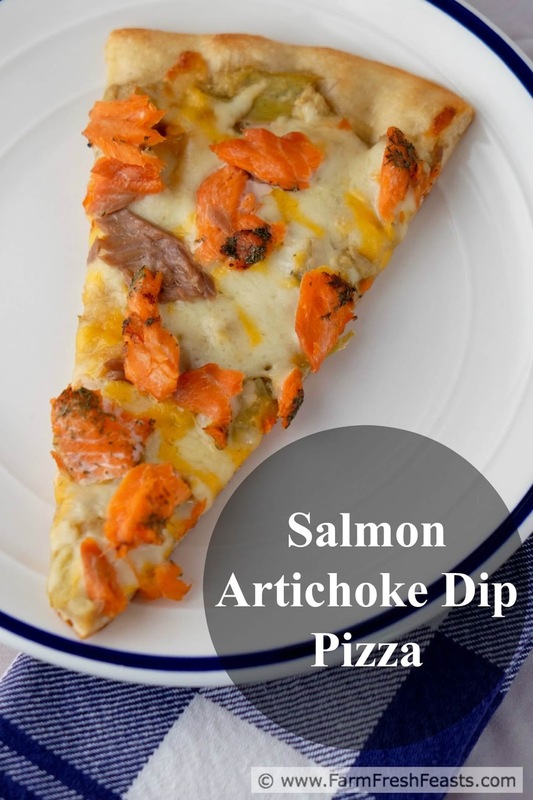 If you want to eat seafood on your Friday Night Pizza Night, I'm adding a 5th recipe idea to my newly-made category to give you options--this Salmon Artichoke Dip Pizza. Being a big believer in 'cook once, use the leftovers in a pizza' I had some extra baked salmon and chopped artichokes handy. With glee, I figured I could deconstruct salmon artichoke dip and turn those flavors into a pizza. Instead of conveying the dip to my mouth on a tortilla chip or baguette slice, I'd use a pizza crust. When adding cooked seafood to a pizza I have found it's better to toss it on for the final few minutes of cooking, just to get the (ahem) flesh warmed up, and not to overcook perfectly cooked (and previously cooked) fish. I'll get to raw fish on a pizza when I get to it. Which sounds like pizza sushi, and I don't mean to go there at all. Instead, let's go to the housekeeping. For more recipes using artichokes, please see my Recipe Collection Using Veggies In Jars. It's part of the Visual Recipe Index by Ingredient, a resource that sorely needs a Salmon category. Heck it needs a bunch of protein categories. Anyhow . 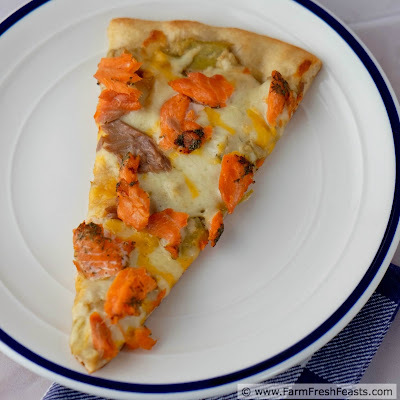 . . if you're interested in additional Friday Night Pizza Night recipe ideas, head on over to the Visual Pizza Recipe Index, now with a Seafood Pizza Category. I'm pinning pizza recipes, follow me on Pinterest for more. I'm sharing the occasional 'as it happens' pizzas on my Facebook page, and I may get up the gumption to post a pizza photo on my Instagram feed. Want to know how to use this blog? For general pizza-at-home tips and tricks, please refer to my Pizza Primer. Preheat oven to 450 degrees Fahrenheit. I have an old pizza stone that I use to make terrific crusts. It's paid for itself over the past 15+ years of service. Get one--here's an Amazon affiliate link to mine . Preheat it too. On an oiled piece of parchment paper stretch the dough out into the shape it feels like assuming this day. Brush the crust with a bit more olive oil. Stir Worcestershire sauce into chopped artichoke hearts, then spread evenly across the dough. Scatter shredded cheeses on top of the artichokes. Slide the parchment paper and pizza into the hot oven. Use a cookie sheet if you don't have a baking stone. 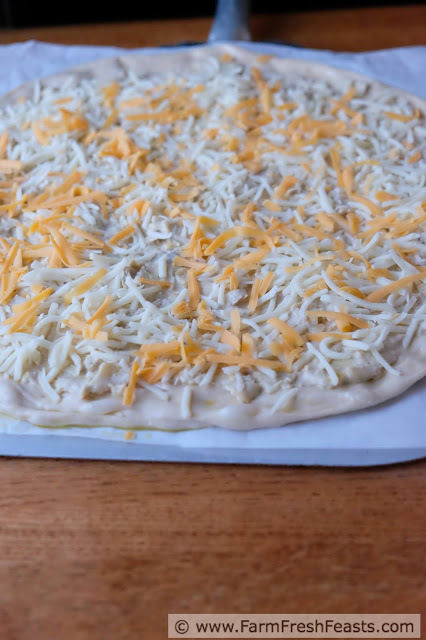 Bake for 5 to 8 minutes until the cheese is melted. At this point you've got a meatless pizza, if you're interested in a vegetarian option I'd stop here. Remove the pizza from the oven (trust me on this one, I have the burns on my wrist to prove it), scatter salmon flakes across the top, and return to the oven. This time, I shimmy the parchment paper out from under the crust so it bakes directly on the stone. Bake for an additional 3 minutes until the fish is warmed through. Slice (Amazon affiliate link to my trusty slicer) and serve. Looks delish! 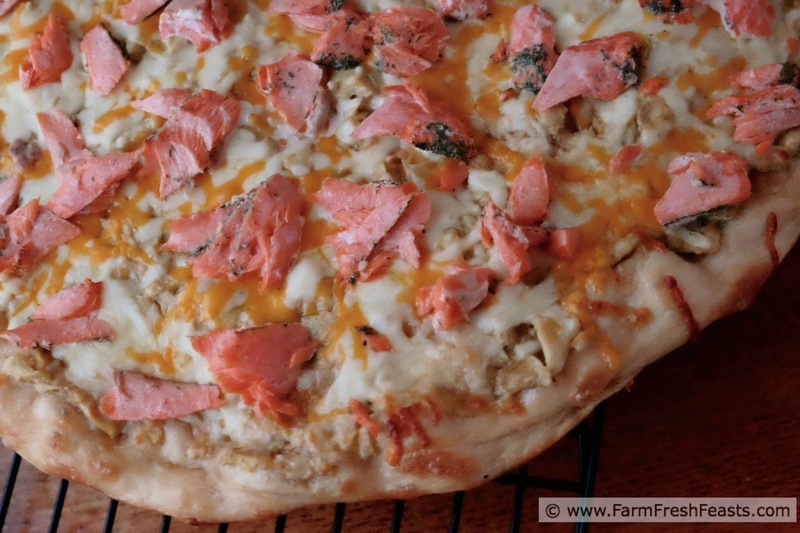 We've added salmon to a pizza with caramelized onions and pesto (instead of tomato sauce). 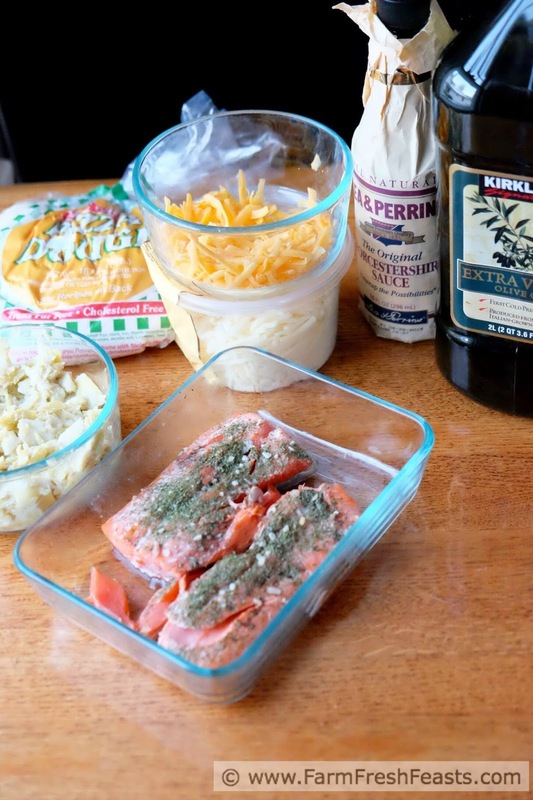 Salmon makes everything exponentially better :) I'll have to try this combo next time we have salmon leftover for a fun pizza. That pizza sounds wonderful. At the end of our local farmer's market season I grabbed a bunch of big fat candy onions and caramelized them all, then froze them in small amounts. I know what combo I'm trying next. Grilled cheese--excellent leftover stashing place. And omelets or frittatas, too. It's funny how your mind switches to the possibilities when you think this way.